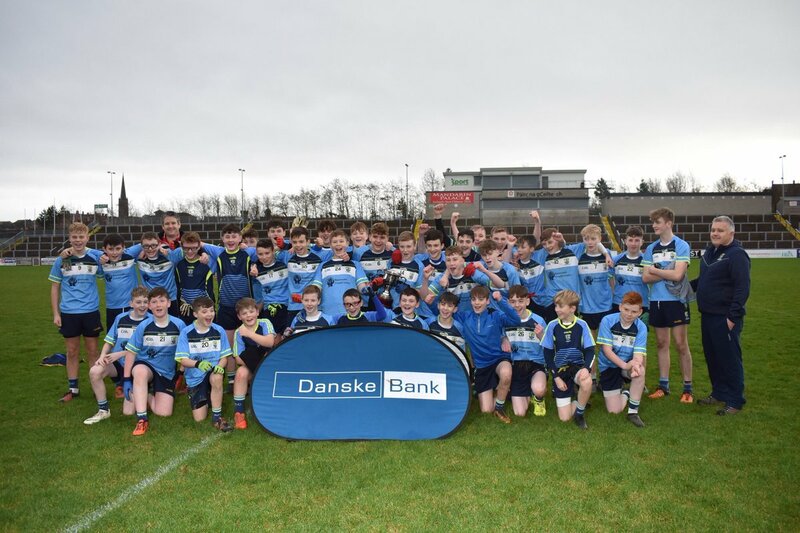 THE ability to hit the net brought both Magh Ene Bundoran and St Conor’s into this Danske Bank Gerry Brown Cup final, and six first half goals yesterday insured that the east Derry school that was created just four months ago from the amalgamation of St Paul’s Kilrea and St Mary’s Clady had its first trophy. The half-time score of 6-3 to 0-3 didn’t reflect the overall pattern of play, but those goals, five of which came in the 11 minutes before the break, really settled the destination of the Cup. Eoin Mullan struck for the first green flag after ten minutes and St Conor’s were just 1-3 to 0-1 ahead after 17 minutes. Then everything changed. Oisin Casey started the blitz with his goal in the 19th minute, Sedgae Melaugh added two more, Casey converted a penalty and Tommy Rodgers hit the sixth goal, while Joe McGloin tried to lift Bundoran slightly with two points right on half time, but the game was up at that stage. There was just a point for each team during the third quarter, but Segdae Melaugh completed his hat-trick ten minutes from time with Magh Ene’s battling qualities rewarded with a late goal for their best player, Matthew San Pedro. Others to play well for Bundoran were Jack Warnock and Eoin Gallagher, but Segdae Melaugh and Eoin Mullan established a strong platform for St Conor’s both through their long ball delivery and with their thrusts forward from the middle of the pitch. The pair also scored four goals between them. Subs : Jayden Warnock for L Clancy, S Kerins for L Smyth, K McMahon for R Wiggs, D McGloin for D Kerins, M Gallagher for B Higgins.